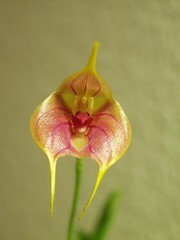 To people who are not familiar with it, Masdevallia doesn’t even look like an orchid. Masdevallias resemble kites in flight. 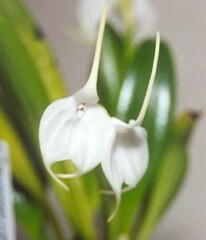 These orchids have very exaggerated sepals (the top central and the two bottom “petals”), so much so that the three parts merge together to form a tube with tail-like extensions. On the other hand, the top two side petals and the lip are minuscule. The tiny lips will rock back and forth in the breeze. That’s why when mine bloom, I can’t help but blow on the flowers all the time! Their single oar- or paddle-shaped leaves grow very close together and spread very quickly to form large clumps. Flower spikes emerge at the bases of the leaves. Masdevallias are cool-growing orchids naturally found in the high-elevation South American Andean cloud forests, with the highest concentration in Columbia, Ecuador and Peru. As you can imagine, kite orchids are constantly bathed in dense fog and rain in the cloud forests, so in cultivation, they also need continuous moisture and high humidity. Because of the constant wetness, good air movement is crucial to prevent fungus and bacteria. Moreover, they dislike water with high dissolved minerals, so go easy on the fertilizer (monthly at a quarter of the strength) and flush out the potting medium thoroughly every time you water. These compact and miniature orchids do not demand much light; one thousand candle-lights (about the light level of Phalaenopsis) will be sufficient, making them good candidates to be grown under artificial lights. Your kite orchids enjoy cool temperatures. They like to stay within 65-75°F (18-24°C) during the day and during 55-60°F (12-15°C) the night. Be sure to keep them under 80°F (26°C) at all times; anything higher will surely stress them out. You should grow these humidity-loving plants in 60-80% humidity. 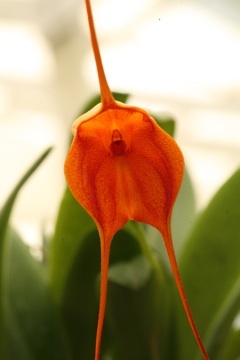 American Orchid Society provides a good one-page free culture sheet on Masdevallia, so you can print one out as a reference. Grow your kite orchids in well-drained potting material. I grow mine in bark, perlite, charcoal and sphagnum moss in clay pots. Even though clay pot will dry the medium out more quickly than plastic pot, hence requires more frequent watering, it create a micro-climate that is a degree or two cooler. I see that some growers put their plants in just sphagnum moss, but I found that keeps the roots too soggy. It’s quite easy to multiply your plant. All you have to do is to pull the clump apart. Just make sure that each division has at least 5 or 6 stems and has sufficient root system attached to support it. Moreover, the appropriate time to divide your orchid is in the winter, without the stress of the hot weather. This allows your plant to recuperate quickly and establish itself.